I’m obsessed with uniform dressing, but haven’t taken the plunge. As an INFP, I dwell in possibility, and the thought of committing to wear the very same thing every day, forever and ever, gives me the willies. But it also sounds amazing. I’ve been inching my way towards a uniform: I stick to a very basic wardrobe (and makeup + hairstyle) on mornings I leave the house early to write. On those mornings, I love not having to think about my clothes for a second. 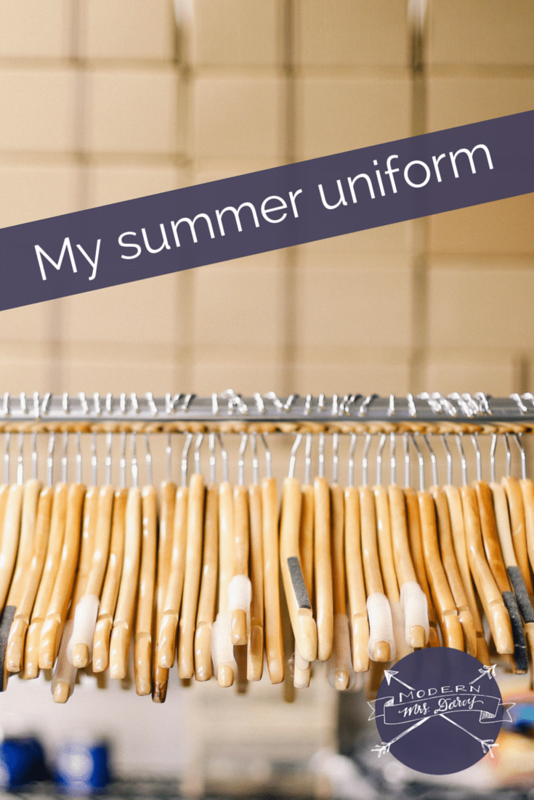 Based on that small victory, I’m giving a more comprehensive uniform a trial run this summer. Summer dressing is easy where I live: it’s hot and humid, so carefully planned layers just aren’t an option. I tend to wear the same things every day in the summer anyway; it’s not a huge leap to formalize it. 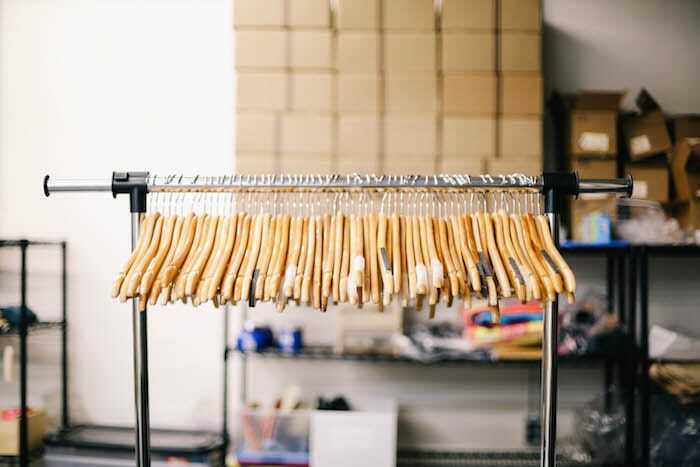 If you know what to look for, you can find great garments (almost) anywhere, but in the spirit of making things easy for my fellow shopping-haters, I’m sharing specific items. A word about tanks, because it took me years to figure this out. I used to buy the smallest size that “fit,” as many women do. But I never asked myself how I wanted the garment to fit: did I want it to be form-fitting or drapey? This season, I want drapey, and I sized up to get that effect. 2. Everlane linen tank. ($30) This is a high-neck, tailored tank with a highly textured feel. It’s slightly sheer. This is easy to wear and looks great on its own, but the side vents make it difficult to layer. Care instructions are hand wash cold, lay flat to dry. Mine has washed beautifully. The medium fits me perfectly. I have three basic necklaces I wear all the time from Stella and Dot, Popbasic, and Stitch Fix. Flats or silver sandals plus my go-to tote bag. This look is easy to put on, easy to wear, and easy to dress up (nicer pants, blazer) or dress down (tank, necklace, sandals). Everything goes with everything else; I could get dressed in the dark. I’m curious to see how my personal experiment goes. Got any tips for me? Do YOU have a personal uniform? What does it look like? P.S. The ten item wardrobe and dress for the life you want to have. Also, get 30% off women’s styles at J. Crew with the code SHOPNOW. 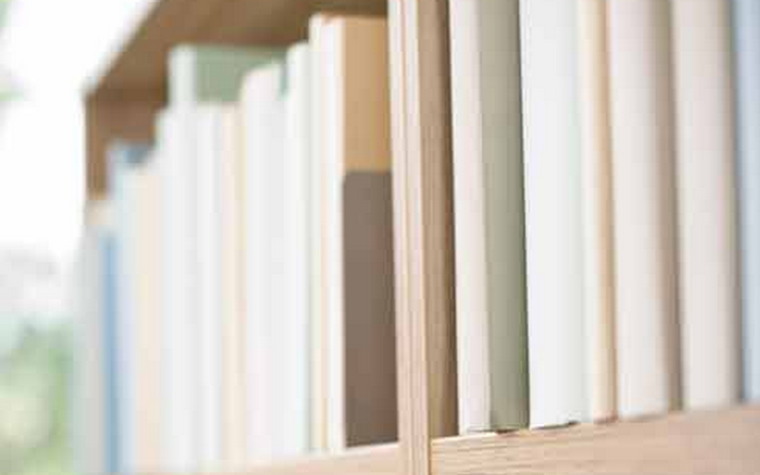 Previous: 7 favorite books in translation to read this year. 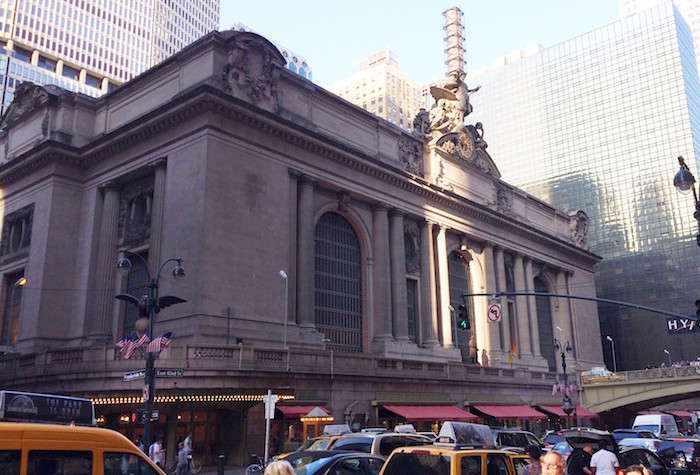 Next:The satisficer’s guide to NYC. No tips, no uniform, just wanted to say I love your posts on this topic and please continue exploring this! Be brave and mix ’em! It’s ok these days. I’m loving the loose, flowy items that are coming back!!! Which tank do you have on in that picture at the end? Thanks to your ten item wardrobe post I bit the bullet and sorted through every stitch of clothing that I own!!! I didn’t narrow it down to only ten items, but I did narrow it way down. I’m with you: I wear the same handful of clothes 5 days a week, but I like to have extra options for the other two days and also any traveling/vacations that I take. The navy tank at the end is the Everlane Ryan style. As simple as it is, I never thought of sizing up for a looser fitting tank. But that is exactly the kind of tank I’d rather have. I also love that you just have white and grays and a navy. Gray seems to be the color I gravitate towards mostly, with a healthy dose of whites thrown in. As far as a personal uniform goes, right now it’s some sort of light top and most often a pair of skinny maternity jeans or a maxi skirt. I’m also embracing the ease and comfort of knit dresses more and more this season. I really wish I could take the plunge, but I’m finding it is hard for me to commit. I think it is mostly because I’m in an office environment where I work with the same ten people, and I’m worried (why? I don’t know) people will notice. That being said, I’ve started to simplify my wardrobe to blues, blacks and greens, and have a few staples that I wear all the time (I LOVE Everlane pants for this). Keep us updated on how this is going! I wonder if I make the plunge, will I get bored with my limited options? Do you think you will? My summer uniform differs from my winter uniform in that I swap my black dress socks out and wear white dress socks in the warmer months. Of course the leather sandals, Bermuda shorts and Hawaiian shirt that go with the knee-high dress socks are year-round wear. The black muumuu over all makes the whole outfit really work. Tim is my favorite person who comments here Anne! I wish I could do loose and flowy, because Georgia humidity, but it looks and feels ridiculous on me. I found out why when I discovered that I’m a Type 4 (Dressing Your Truth). We 4s only look and feel right in tailored, snug clothing. Thanks for the specific brands, we clueless ladies appreciate it. Another GA girl here, and with a large bosom (thank you, Mammaw, I think…), anything loose just balloons out on me and adds 30 pounds from bustline to waistline. Summer is a hard season! I still need to do my DYT profile. I have a good friend who describes herself exactly as you did here and she must be a 4. I need to figure out my type because I’m sure it would help me to see a checklist of sorts in writing. I’m doing Dressing Your Truth now and as a Type 3 it has momentarily thrown me for a loop because I’ll never give up my crisp white! That said, I think Dressing Your Truth would really go well with creating a uniform so to speak. I don’t have a uniform wardrobe, so there are no tips for me to share. I do have a fairly minimalist wardrobe, but it’s quite eclectic, allowing me to mix and match various pieces together to create a whole new look using the same basic pieces. I love playing with clothes and find I feel better about myself when I take the time to make a conscious decision about how I want to look on that particular day. Clothes have such an incredible power! Oddly enough I wore a more boldly patterned shirt to work that I typically wear to work and two people liked it and commented on it. The odd part is that my clothes being noticed made me feel uncomfortable. Love this post! I live in Saudi Arabia on a conservative compound, and I wear the same thing every day. A caftan with a modest neckline. A lightweight cardigan to keep my arms from frying. Birkenstocks. A massive straw sun hat from REI. Sunscreen all over. My husband teases me about how many caftans I have, but I can go through several in a day because of sweat (gross, right?). I have been doing the same thing, Jamie. I have several Jostar dresses, and it just doesn’t get any easier in the summer. I love that about dresses. One piece and DONE. And so cool on hot summer days. I love the simplicity of your summer uniform. I take a capsule wardrobe approach, which ends up looking very similar in practice. In my case I have to prioritize easy to care for fabrics: no dry clean only, no handwashing, nothing that requires frequent ironing, for this state in life with young children. A simple wardrobe is a great thing when you have just a few minutes to get ready before kiddos start making mischief! Love your necklaces and bag! Hi Anne, Thank you for your holistic approach to your blog. There is always something for me to enjoy, learn, reflect upon and bring forward. But I wanna know about your go-to tote bag! Stitch Fix from a few years ago. Their house brand 41 Hawthorne. I love having decisions already made for me. It frees me up to be able to focus on something else in the morning. I’ll definitely have to try the uniform idea! I love this look but cannot dress like this due to I am naturally grossly to big on top. I never wear tank tops of any kind. have to wear only crew neck tops as all men are pigs and act like idiots when I go out in public. You’ll appreciate this: my college roommate had the same problem and our senior year she was a bridesmaid in a ridiculous number of weddings and every single obligatory dress was low cut with teeny tiny spaghetti straps. I still laugh/cringe when I remember her ranting. She made it funny but it was a serious, serious problem! Where are your sandals from? I’ve been looking for a pair of simple sandals for summer and those are really cute! They’re a few years old, from Target. I’m hoping they’ll bring them back because I’m seriously wearing out this pair. Anne, have you checked recently? Those sandals were my main footwear last summer, and I wore them out. Bought two pairs (!) from my local Target (in Michigan) this summer. Definitely worth stocking up IMHO. So good to know—many thanks! In the summer I gravitate toward dresses for work because they’re cooler. In winter my uniform would be black pants or skirt or maybe jeans with a sweater and scarf and boots. I’m doing a maternity uniform this summer, mainly dresses and leggings with tanks. I’m hoping next year when I’m done having babies to start a more permanent uniform! Where is that tote bag from?? I love it! It’s a few years old, from Stitch Fix’s house brand 41 Hawthorne. I have pretty much the same uniform, only add in some target v-necks on more casual days! The weather where we live stays pretty neutral so it’s my year round uniform! My personal uniform consists mainly of “dressy” t-shirts in a variety of colors (mostly black, gray, and blue). Casual midi-length skirts and shorts for warmer weather and jeans for the cooler months. Depending on the weather, I’ll layer up either with a big scarf or a lightweight cardigan. Jewelry is kept to a minimum (silver and pearls- I look awful in gold). Thanks to an old post of yours about how to ruin an outfit, I’m searching for a denim jacket. No luck yet. I do have a question for you. On those mornings you leave to write, do you use your big brown tote to hold work items (laptop, notebook, etc) or do you have a dedicated work bag? I work from home, too and am in a quandary about what option works best. I always have a pencil pouch in my tote, and I have a separate laptop bag. Usually all I need is my tote + laptop bag but if I need any additional papers I put them in my purse. That prevents me from accidentally finding myself out and about, in need of my notes, but without my laptop bag. Great post and thanks do much for the brand suggestions, too! What do you wear under loose tank tops? A cami, or sport bra or regular bra? I am self conscious about showing any bra under my arms or when I bend over. Thanks again for your helpful clothes and shopping tips. 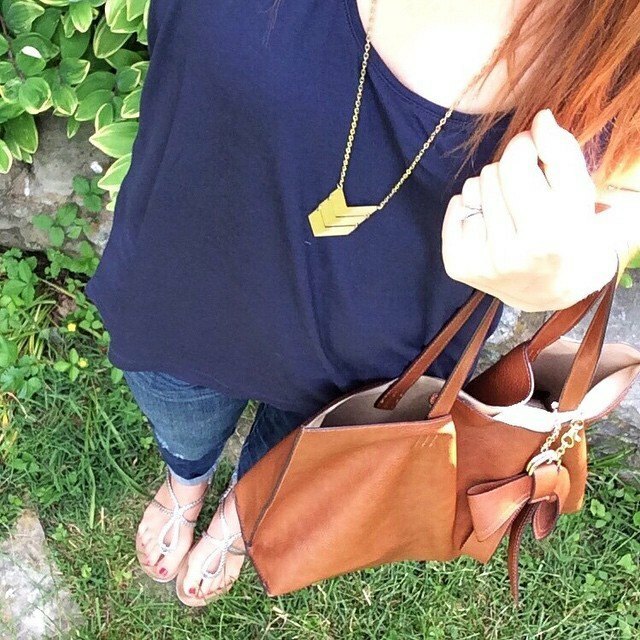 Ps–for all the ladies wondering, her lovely tote bag is from Stitch Fix! I remember the post about it, I loved it and still do. Glad to see it’s holding up so well. I wear a cami if I need something under a tank top. I have snug ones that I wear in the winter, but in the summer I like something loose. Thanks for the reply! Cheers! It’s a few years old, from Stitch Fix. Love this post! I’m thinking about picking up some of those J. Crew tanks, but does the racerback show bra straps? I’m still breastfeeding and don’t own a racerback bra anyways. The Everlane tanks look great too! The J Crew definitely shows bra straps on a standard bra. It’s fine with a racerback or other nipped-in straps. new reader who is enjoying your blog! 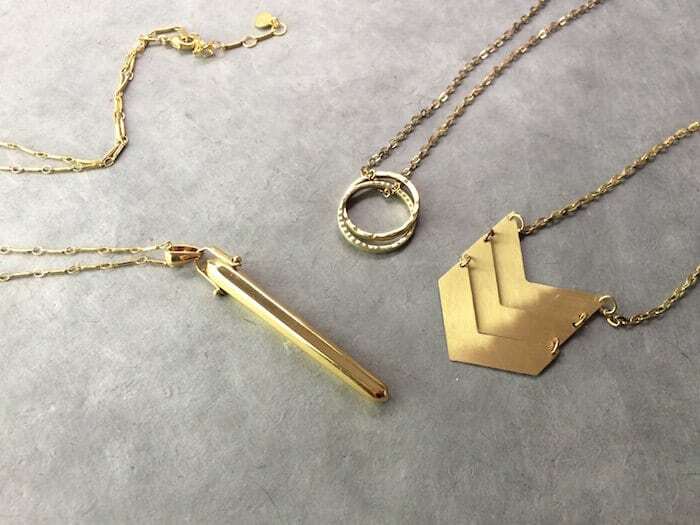 Is the chevron necklace from stitch fix? Is it a particular brand? I love it. It is from Stitch Fix but I have no idea what the brand is! I’ve only done shirts with them; in most styles I prefer the large because of the way I want it to fit, even though the medium actually fits properly (i.e., the way it is “supposed” to). If the description says the style is “loose,” I order the medium. I stumbled across this post last week and it’s changing the way I get dressed in the mornings. I used to struggle for several minutes and often run late because I had a closet full of clothes that were hard to wear/put together. I read this and instantly pulled out my 2 pair of favorite jeans, khakis, and a pair of shorts plus a few simple v neck tees or tanks. I add my favorite necklace and sandals and have a pulled together, but simple outfit. Mornings now are a breeze and I always feel like my personality can shine, instead of my clothes. I’m wondering if I’ll get bored with this way of dressing, but so far I love it! Thank you so much for sharing!!! I’m so glad to hear it!! Anne, thank you so much for this post! It feels gorgeous and summery, and while it’s winter here in New Zealand, I feel like I have a head start in which to be curious about what my uniform might look like. I’ve been thinking about it for a while, and how it might save my sanity and free me up to make more exciting, creative decisions with my energy! P.S. I love the necklace in your Instagram pic today. Drool!